George W. Bates : Surf-riding at Lahaina, Maui, 1854. Bates, George Washington: Sandwich Island Notes. Harper & Brothers, New York, 1854. Harper & Brothers, New York,1854.. 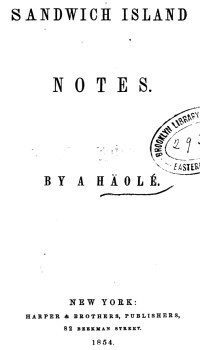 The book was published as two works, one attributed to Bates and anonymously as A. Haole (a white visitor). Although he travelled to Waikiki (page 93), apparently there was no surf-riding in evidence. The account is notable for the description of the Hawaiian surfers negotiating their way out through the breaking surf, "as they proceed seaward, they dive, like ducks", a manoeuvre currently known as duck-diving. Within a mile of the crater's base is the old village of Waikiki. It stands in the centre of a handsome cocoa-nut grove, among whose feathery foliage the soft winds from the ocean produce a gentle, murmuring music. There is a fine bay before the village, in whose waters the vessels of Vancouver and other distinguished navigators have anchored. Waikiki was once the abode of that Hector of the Hawaiians, Kamehameha the Great. The old stone house in which the great warrior once lived still stands, but it is falling into a rapid decay. I could not help lingering for a time to notice the objects scattered around. There were no busy artisans wielding their implements of labor; no civilized vehicles bearing their loads of commerce, or any living occupant. But beneath the cool shade of some evergreens, or in some thatched house, reposed several canoes. Every thing was as quiet as though it were the only village on earth, and its tenants the only denizens. A few natives were enjoying a promiscuous bath in a crystal stream that came directly from the mountains, and rolled, like another Pactolus, to meet the embrace of the ocean. Some were steering their frail canoes seaward. Others, clad simply in Nature's robes, were wading out on the reefs in search of fish. Here in this quiet hamlet, once unknown to all the world, Kamehameha I, surrounded by his chieftains, held his councils for the safety and consolidation of his kingdom. Of the numerous national games and amusements formerly practiced by the Hawaiians, surf-bathing is about the only one which has not become extinct. 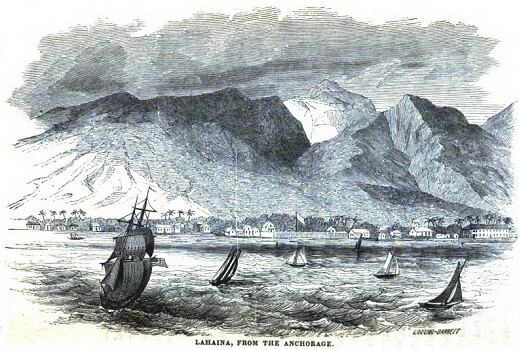 Lahaina is the only place on the group where it is maintained with any degree of enthusiasm, and even there it is rapidly passing out of existence. In other days, there was no amusement which more displayed the skill, or bestowed a greater physical benefit on the performer, than this. Formerly it was indulged in by all classes of persons, of all ages and both sexes, from royalty to the lowest plebeian, at one time and in the same place. Even the huge regent Kaahumanu, and others, by whose coffins I stood and pondered in the royal tomb at Honolulu, were in the habit of bathing in the surf at Lahaina. At this day, the sport is confined more to the youthful portion of the community. cause for excitement and astonishment on the part of an unaccustomed spectator. The swimmers start out from the shore, taking with them their surf-boards. These boards are of dimensions suited to the muscular strength and capacity of the swimmers. As they proceed seaward, they dive, like ducks, underneath the heavy rollers, and come up on the other side. This course is pursued until the outermost roller is reached - sometimes nearly a mile from the shore. The higher the roller, the more exciting and grand is the sport. Placing themselves on these boards, the bathers gradually approach the inward current of the roller as it sweeps over the reef, and, lying on the chest, striding, kneeling, or standing up on the board, they are borne on the foaming crest of the mighty wave - with the speed of the swiftest race-horse toward the shore, where a spectator looks to see them dashed into pieces or maimed for life. By a dexterous movement, however, they slip off their boards into the water, grasp them in their hands, dive beneath the yet foaming and thundering surge, and go out seaward to repeat the sport. This they do for hours in succession, until a traveler is almost led to suppose they are amphibious. This game involves great skill; it is acquired only by commencing it in the earliest childhood. A standing position on the swiftly-gliding surf-board is a feat of skill never yet surpassed by any circus-rider. Geoff Cater (2007-2017) : George W. Bates : Surf-riding at Lahaina, 1854.